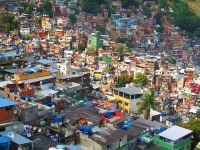 Even though Rio de Janeiro is one of the world's foremost holiday destinations, with great beaches, vibrant night-life, and significant tourist attractions, the hard fact is that it remains a city of gross economic inequality, as typified by its sprawling urban slums (favelas), the largest of which, Rocinha, is home to nearly a quarter of a million people. For tourists looking to get to grips with this social reality, a local named Zezinho runs widely-celebrated tours of Rocinha, the favela in which he grew up. Those worrying that it will be a typical, voyeuristic, seen-from-the-back-of-a-Jeep experience can lay those fears to rest: the great strength of Zezinho's tours is that they are conducted out of love for Rocinha, and a desire to share its culture with foreigners. As Zezinho says, 'It is easy to see poverty or poorly built houses, but what I love about Rocinha is the spirit of the people'. All who take part in his tour of Rocinha agree that it's a valuable, moving and humanising touristic experience. There are also other guides and companies offering good tours of the various favelas. It is important to book in advance.